This year Dr. Ellen Cavanaugh, founder of Grow a Generation teamed up with PA Distance Learning Charter School to create an Odyssey Fellowship program. An Odyssey Fellowship is a ongoing opportunity for students to dedicate time each week to move through an odyssey into a fascinating topic of their choice. Fellows (students in grades 3-12) partner with mentors from around the globe and venture deep into a topic from the cutting edge of science and technology. The Odyssey takes them through four stages where students identify a specific passion in new science and technology, find the businesses and colleges that are doing work with it, tell stories from the field working alongside professional mentors, and begin to develop their own unique identity as a leading spokesperson in the field. Fellowships are ongoing projects (meeting about 40 minutes a week) that enable a student or group of students to write a book, create a digital artefact, or compete in a national or international STEM competition. Fellowships produce artefacts (digital artifacts) worthy of portfolios, college (or grant) applications. For the 2018-2019 school year, PA Distance Learning has six of these Fellowships in place. We invite you to check out each one of these Fellowships below. 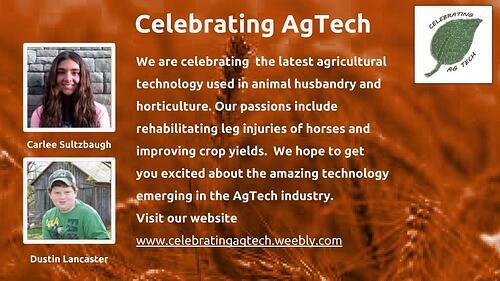 Carlee Sultzbaugh and Dustin Lancaster are Celebrating AgTech! They are bringing you news of the latest agricultural technology used in animal husbandry and horticulture. Check out their latest videos on robotic apple pickers and the IRAP gene therapy used in treating horse injuries. They hope to get you excited about the amazing technology emerging in the AgTech industry and inspired to see what possible STEM careers might be available soon for those who love working with farm animals, orchards, and fields. Joshua McDiffitt and Madison Williams are challenging the students and staff at PA Distance Learning Charter School to fight obesity and accept their fitness challenges! Joshua inspires everyone with his commitment to weight training and cardio health. Madison brings help to those who need modified training to cope with injuries or physical limitations. 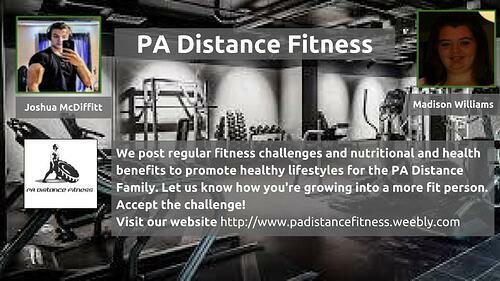 Both work together to post regular fitness challenges, nutritional and health benefits to promote healthy lifestyles, and interviews with leading professions in the field. 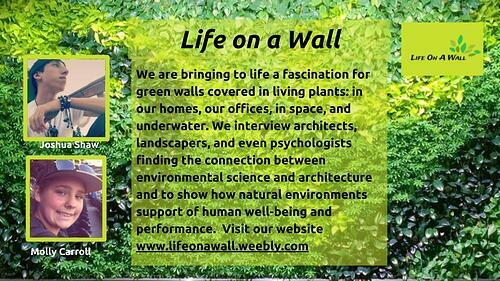 Molly Carroll and Joshua Shaw are bringing to life their fascination for green walls; walls covered in living plants in our homes, our offices, in outer space, and even underwater living spaces. They interview architects, landscapers, and even psychologists finding the connection between environmental science and architecture and to show how natural environments support of human well-being and performance. Come discover more about this unique integration of science, engineering and artistic expression. 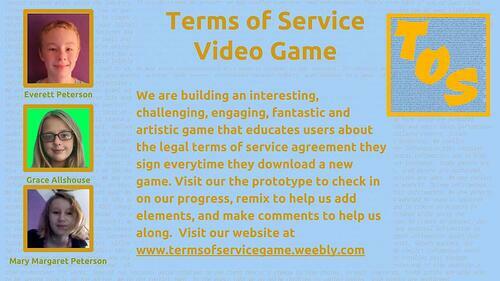 Grace Allshouse and Everett and Mary Margaret Peterson are building a game to teach people about those pesky Terms of Service and Privacy agreements we sign. Assisted by local and international leaders in privacy law, the team is working hard to include elements of good game design with accurate and timely legal information that is important to all of us. The game is being prototyped in Scratch with the hope of moving the elements to a platform that can publish the game for mobile phones. John Underhill and Sarah Vogel are on a Quest for an EOE Gene Therapy. 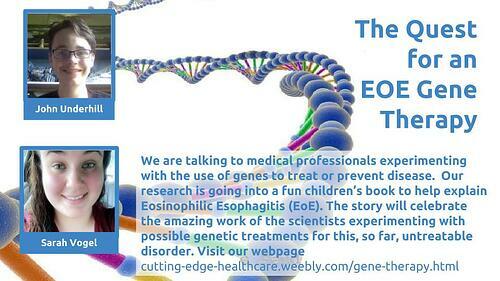 Eosinophilic esophagitis (EoE) is an allergic swallowing disorder that affects a member of the team. So far, there is no effective treatment. But hope is on the horizon with the doctors experimenting with gene therapy. Come learn more as they complete their children’s book and illustrations. A.J. 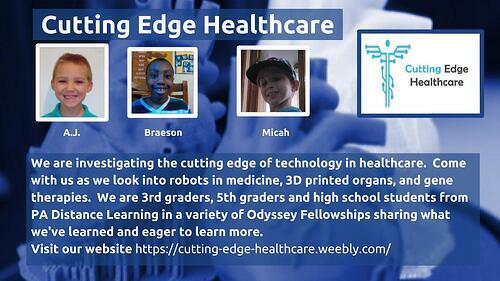 Knorr, Micah Kingsbury and Braeson Langley are at the Cutting Edge of Technology in Healthcare. They are bringing you news of robots in the operating room, 3D printed organs, and making room on their amazing website for older classmates who are exploring gene therapy. Check out their latest videos on robots in medicine, the Davinci Surgical System, and 3D printed hearts. They want to help classmates prepare to be scientifically literate as they face new technology in their healthcare choices. Check out what new possibilities await in the cutting edge of medical tech.